There is no future, only empty vastness on the Warlock's Moon. The artificial world was built as a wonder, a monument to supernatural hubris, by the Warlock without a Mother, alone or with his cabal of lesser wizards . The bleak orb spins with the green and blue Earth always in view, a cold mansion of clean grey stone. On the moon's surface there is little vegetation and no fauna except the abandoned experiments of the insane cabal that fled forty years before. Yet in this hostile and stultifying place the wizards marooned their servants and sycophants without a thought when they grew bored. Now only the young have any hope, and only a few of them at that, the few youth brave enough the venture into lands beyond the towns' sigils in the search for meaning and valuables. Valuables, because they are beautiful, and because the traders must have something to trade for - if they are to keep coming. Secretly a forgotten hope draws the young to risk thier lives and souls amongst the grey stone wastes - there is always the almost forgotten hope that someone might find a way off of the warlock moon and away from its cobbled grey vastness. Makepeace No Hells is one of those youth, strange from birth with a family that has descended into a sort of irreligious mania in the past generation. A lad lacking in physical defect, though never more than average in intelligence, some have claimed that there is experimental blood in him. Since he was 14 Makepeace has become stranger then even his odd relatives, now seen only in a concealing ancient guard's helmet, and full of stern righteous pronouncements that make little sense. It is for the best then, That Makepeace, grown to manhood, along with two other quarrelsome youth, and a hired wastrel, pledged to set off towards the nearest entrance to the moon's interior seeking plunder. Reliable stories are hard to come by, but rumors of acid dripping antelope, strange man like things, walking corpses and lakes of living fire abound. The Elder Belina knows the most, having been a young woman in the Warlock's time, and having wandered the moon's interior when the protections around her home town failed. Even Belina's memories are clouded though when she speaks of the darkened galleries beneath the moon's cobbled surface. She remembers labyrinths of stones and even a town of humans in the darkness, an entire village in the rock, but she remembers as if wakened from a dream. The shaft downward is well known, less than a mile from the sigils, and descent is without too much difficulty. The sixty foot shaft widens as it descends, spiral stairs firmly anchored and winding down away from a circle of light. The shaft is the ever present, unremarkable grey stone, with the last 30' made curious by a large golden pillar, chipped and scratched, that rises form the shaft's bottom. At the foot of the stairs is a round chamber with three exits. Looking around, the band of youth decides to try the one with a door. Old bronze, but well oiled with only a light patina, Makepeace opens the door by wedging the haft of his pole-axe under the levered catch. The door opens onto a twisting hallway, with two identical door after only a few feet. This door to the South is also easily opened, leading into another kinked hall, which opens into a room after forty feet. The room beyond is occupied by twelve helmet like grotesques, softly glistening heads with fierce tusks, trunks, and a riot of squamous tentacles. The abominations squeak excitedly as they spot the party, rolling, hopping and squirming across the floor towards the adventures with hungry looks in their wild bulbous eyes. Deciding to retreat before this platoon of magical abnormality, Makepeace is able to smash one, the Warlock spears another, and the Chimney Sweep puts an arrow into a third before the party reaches the first bronze door and slams it shut behind them. The party is panting, proud to have survived but disturbed by the ferocity of the strange bulge eyed creatures, and it isn't until the adventures prepare to set off again that Makepeace notices a wicked gash on his leg. Limping, the self proclaimed "Paladin of No Gods" follows the rest of the party to the second, Southeastern doorway. The Southeastern door opens onto a round room, easily eighty feet across, with an alchemical laboratory set up in it's center and a ring of spikes on the ceiling surrounding it. The Warlock's lack of athletic ability manages to save the party, when his attempt to grapple a valuable looking chair falls short, and the hook whips upward towards the spiked ceiling due to an artificial sorcerous shift in gravity. With the danger clearly visible, the adventurers hatch a scheme to grapple the large table and send the party's tiny Sweep, a lad far younger than the other two adventurers and emaciated (perhaps due to a gruel allergy), across the rope. The plan works, with the nimble sweep performing some interesting gymnastics as the gravity shifts. With some additional rope work the nimble youth is able to ferry everything, except the heavy work table, across the reversed gravity zone. Carrying thier finds back to the stair shaft and concealing them in the shadow of the stairs, the party sets off to the North. To the North an ominous inscription hinting at madness and death warns the party that beyond a wrought iron fence lurks unspeakable horrors and confusion. Tying a rope to his waist, the party sends Makepeace though the gate, and the helmeted fighter, buoyed by his lack of faith, opens the door beyond the gate into an almost featureless room with additional doors on each wall. The doors proves to be magical traps, only visible from one side. However, by always leaving one party member in the previous room, the adventurers are able to explore the magical maze to a depth of three doors. This exploration is fruitless, as other than freeing a long lost spirit from endless wandering, they discover nothing of interest or value. Returning to the central chamber and finding the inlaid chair from the reverse gravity room missing, the party drags their remaining loot back to town and are met as returning heroes. The books discovered promise to prove interesting and may be valuable enough to trade for food or news when the lean, hard faced traders come striding through town again. Departing the next morning for the underworld, the adventurers meet with no opposition, even the bouncing helmet creatures seem gone. Investigating the hall to the East, the party discovers a vast well leading down 40' to a paved avenue that is flanked by villas and matte white tufts of grass. Climbing to the Northern villa and peering down from its red tile roof the party spots more strange white grasses, a white oak tree with black leaves, and a white berry bush in the villa's courtyard. Dominating the courtyard is a 20' tall stone statue of a fisherwoman, stone trident in one hand, and golden hook in the other, surrounded by stone carp. Makepeace grapples the golden hook free and the party descends to the courtyard. Gathering as many berries as possible, the adventurers then set out to explore the silent rooms of the mansion. The first room contains white and red tile laid in an ominous spiderweb symbol. A chest in the corner of the room looks suspicious, so Makepeace flips it on it's side and using the back of his throwing hatchet punches a hole in the bottom. Endless water streams from the chest, geysering and fountaining outward, leaving the fighter drenched. Efforts to plug the chest are partially successful and the band carries it back to town, where it sadly proves not to be an eternal source of water. Despite the disappointment of the magical chest, the berries are sweet, delicious, and worth their weight in silver. Makepeace purchases burlap sacking and string, intent on stealing the berry bush. Returning again to the villa, makepeace digs up the berry bush and binds it with twine, promising himself that he will return for bags of soil. The adventurers continue to explore, and find a workshop containing a boat and woodworking materials, but nothing of great value. The Bedroom on the West side of the villa is more interesting as the bed contains a grey bearded figure that moans and complains in a deep slumber. Despite Makepeace's urgings to set the undead sleeper ablaze, the party stealthily loots the room, finding only a key, and leaves the creature to it's eternal rest. In the kitchen of the villa the adventurers encounter another strange, but peaceful, denizen - a stooped, lanky giant calmly eating the haunch of a cow sized rabbit carcass. After a few pleasantries and a warning about 'kobalds' to the South from the giant, the Warlock leads the party to the villa's final room, a trophy hall, where several loud animated fish on the wall mock and insult the adventurers. Makepeace smashes the fish with his pole ax, but fails to intimidate them, so he stuff the last in his bag after gagging it (the fish proves worthless). The Warlock discovers a bookcase in the room, and the party agrees to take it to the surface. As the party attempts to carry the bookcase out the front door of the villa, Makepeace's clumsy stride snaps an almost invisible tripwire that releases the charge on an ancient magical battery. The grinding of stone is heard from the courtyard, and a glance backwards down the exit passage reveals three decorative stone fish and the fisher statute animated and moving with obvious violent intent towards the party. The large statute cannot enter the exit hall, but the three fish manage to almost corner the Warlock as he dithers over leaving the books. Makepeace steps back successfully holding off one of the stone fish, but another flops onto the Warlock and bruises him badly. Abandoning the case, but carrying off the berry bush, the party flees out of the villa and towards the grey light of the surface to try again after a week or two of rest. What a fantastic write-up .... Very evocative. More thorough than my notes! A good writeup. I'm glad you guys have fun. I'm looking forward to making this a larger campaign. 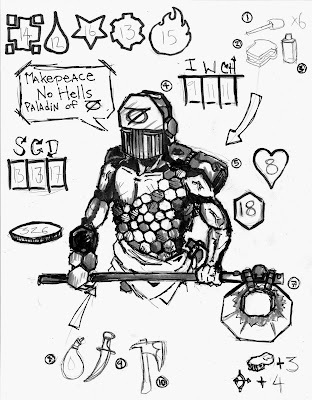 That is one fantastic character sheet. I kinda want to drawn a blank pair of these sheets with a silhouette for the PC in the center - kinda like the old Champions sheets.